“We believe in the same organization that existed in the Primitive Church, namely, apostles, prophets, pastors, teachers, evangelists, and so forth” (Articles of Faith 1:6). Jesus established His Church when He was on the earth. It was called the Church of Jesus Christ (see 3 Nephi 27:8), and the members were called Saints (see Ephesians 2:19–20). For teachers: Consider inviting each member of your family or class to study one of the six features that identify the Church—the italicized headings such as Revelation and Authority from God. (In large classes, some members will be assigned the same feature. In families and small classes, some members may be assigned more than one feature.) When they have had time to study, invite them to discuss what they have learned. When Jesus established His Church, He personally instructed and directed its leaders. He, in turn, received His instructions from His Father in Heaven. (See Hebrews 1:1–2.) Thus the Church of Jesus Christ was directed by God and not by men. Jesus taught His followers that revelation was the “rock” upon which He would build His Church (see Matthew 16:16–18). Before Jesus ascended into heaven after His Resurrection, He told His Apostles, “I am with you alway, even unto the end of the world” (Matthew 28:20). True to His word, He continued to guide them from heaven. He sent the Holy Ghost to be a comforter and a revelator to them (see Luke 12:12; John 14:26). He spoke to Saul in a vision (see Acts 9:3–6). He revealed to Peter that the gospel should be taught not only to the Jews but to the whole world (see Acts 10). He revealed many glorious truths to John, which are written in the book of Revelation. The New Testament records many other ways in which Jesus revealed His will to guide His Church and enlighten His disciples. The ordinances and principles of the gospel cannot be administered and taught without the priesthood. The Father gave this authority to Jesus Christ (see Hebrews 5:4–6), who in turn ordained His Apostles and gave them the power and authority of the priesthood (see Luke 9:1–2; Mark 3:14). He reminded them, “Ye have not chosen me, but I have chosen you, and ordained you” (John 15:16). That there might be order in His Church, Jesus gave the greatest responsibility and authority to the Twelve Apostles. He appointed Peter chief Apostle and gave him the keys to seal blessings both on earth and in heaven (see Matthew 16:19). Jesus also ordained other officers with specific duties to perform. After He ascended into heaven, the pattern of appointment and ordination was continued. Others were ordained to the priesthood by those who had already received that authority. Jesus made it known through the Holy Ghost that He approved of those ordinations (see Acts 1:24). The Church of Jesus Christ was a carefully organized unit. It was compared to a building that was “built upon the foundation of the apostles and prophets, Jesus Christ himself being the chief corner stone” (Ephesians 2:20). 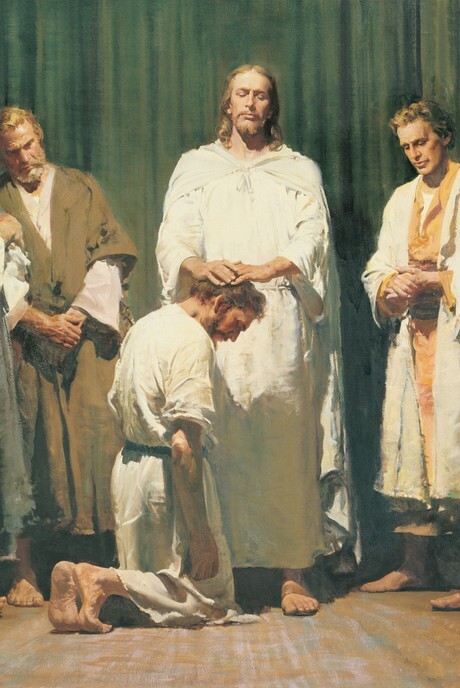 Jesus appointed other priesthood leaders to assist the Apostles in the work of the ministry. He sent officers called Seventies in pairs to preach the gospel (see Luke 10:1). Other officers in the Church were evangelists (patriarchs), pastors (presiding leaders), high priests, elders, bishops, priests, teachers, and deacons (see chapter 14 in this book). These officers were all necessary to do missionary work, perform ordinances, and instruct and inspire Church members. These officers helped the members come to a “unity of the faith, and of the knowledge of the Son of God” (Ephesians 4:13). The Bible does not tell us everything about the priesthood or the organization and government of the Church. However, enough of the Bible has been preserved to show the beauty and perfection of the Church organization. The Apostles were commanded to go into all the world and preach (see Matthew 28:19–20). They could not stay in any one city to supervise new converts. Therefore, local priesthood leaders were called and ordained, and the Apostles presided over them. The Apostles and other Church leaders visited and wrote letters to the various branches. Thus, our New Testament contains letters written by Paul, Peter, James, John, and Jude, giving counsel and instruction to the local priesthood leaders. The New Testament shows that this Church organization was intended to continue. For example, the death of Judas left only eleven Apostles. Soon after Jesus had ascended into heaven, the eleven Apostles met together to choose someone to take the place of Judas. Through revelation from the Holy Ghost, they chose Matthias. (See Acts 1:23–26.) Jesus had set a pattern for twelve Apostles to govern the Church. It seemed clear that the organization was to continue as He had established it. The Apostles taught two basic principles: faith in the Lord Jesus Christ and repentance. After new converts had faith in Jesus Christ as the Son of God and their Redeemer and had repented of their sins, they received two ordinances: baptism by immersion and the laying on of hands for the gift of the Holy Ghost (see Acts 19:1–6). These were the first principles and ordinances of the gospel. Jesus had taught, “Except a man be born of water and of the Spirit, he cannot enter into the kingdom of God” (John 3:5). Jesus has provided for everyone to hear the gospel, whether on earth or after death. Between His death and Resurrection, Jesus went among the spirits of those who had died. He organized missionary work among those who were dead. He appointed righteous messengers and gave them power to teach the gospel to all the spirits of people who had died. This gave them an opportunity to accept the gospel. (See 1 Peter 3:18–20; 4:6; D&C 138.) Living members of His Church then performed ordinances in behalf of the dead (see 1 Corinthians 15:29). Ordinances such as baptism and confirmation must be done on earth. All faithful members of the Church were entitled to receive gifts of the Spirit. These were given to them according to their individual needs, capacities, and assignments. Some of these gifts were faith, including the power to heal and to be healed; prophecy; and visions. (The gifts of the Spirit are discussed in more detail in chapter 22.) Spiritual gifts always exist in the true Church of Jesus Christ (see 1 Corinthians 12:4–11; Moroni 10:8–18; D&C 46:8–29). Jesus told His disciples that these signs or spiritual gifts always follow them that believe (see Mark 16:17–18). Many of His disciples performed miracles, prophesied, or beheld visions through the power of the Holy Ghost. Why does the Church of Jesus Christ need these six features? After Jesus was resurrected, He visited the people in the Americas and organized His Church among them, teaching the people for three days and then returning often for some time thereafter (see 3 Nephi 11–28). Then He left them and ascended into heaven. For over 200 years they lived righteously and were among the happiest people whom God had created (see 4 Nephi 1:16). What does the term apostasy mean? Throughout history, evil people have tried to destroy the work of God. This happened while the Apostles were still alive and supervising the young, growing Church. Some members taught ideas from their old pagan or Jewish beliefs instead of the simple truths taught by Jesus. Some rebelled openly. In addition, there was persecution from outside the Church. Church members were tortured and killed for their beliefs. One by one, the Apostles were killed or otherwise taken from the earth. Because of wickedness and apostasy, the apostolic authority and priesthood keys were also taken from the earth. The organization that Jesus Christ had established no longer existed, and confusion resulted. More and more error crept into Church doctrine, and soon the dissolution of the Church was complete. The period of time when the true Church no longer existed on earth is called the Great Apostasy. The emperor chose his own leaders and sometimes called them by the same titles used by priesthood leaders in the true Church of Christ. There were no Apostles or other priesthood leaders with power from God, and there were no spiritual gifts. The prophet Isaiah had foreseen this condition, prophesying, “The earth also is defiled under the inhabitants thereof; because they have transgressed the laws, changed the ordinance, broken the everlasting covenant” (Isaiah 24:5). It was the Church of Jesus Christ no longer; it was a church of men. Even the name had been changed. In the Americas, apostasy also occurred (see 4 Nephi). What prophecies in the Old and New Testaments foretold the Restoration? God had foreseen the Apostasy and prepared for the gospel to be restored. The Apostle Peter spoke of this to the Jews: “He shall send Jesus Christ, which before was preached unto you: whom the heaven must receive until the times of restitution of all things, which God hath spoken by the mouth of all his holy prophets since the world began” (Acts 3:20–21). John the Revelator had also foreseen the time when the gospel would be restored. He said, “I saw another angel fly in the midst of heaven, having the everlasting gospel to preach unto them that dwell on the earth, and to every nation, and kindred, and tongue, and people” (Revelation 14:6). Why was the Restoration necessary? Consider the blessings that have come to you because the Church of Jesus Christ has been restored to the earth. “Divide the class into small groups. Give each group a few questions to consider. Then have each group report their answers to the class” (Teaching, No Greater Call , 70).